“Since my diagnosis, I have fought a difficult battle but in the last year, all my efforts to get fit and healthy enough to be able to compete and pursue my dreams are now starting to pay off. I first visited Shrewsbury Family Chiropractic back in August this year and have never looked back since! Glenn has worked his ‘magic’ and transformed my day to day life with improvements in my health, fatigue, strength and balance and it feels amazing that my back pain has almost gone. 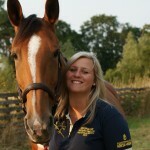 Laura is an inspiration and we look forward to updating you on her upcoming events and competitions.